A common concern for Individuals facing a first offense OUI in Massachusetts is what the potential penalties may be. It is important to understand that on a first OUI offense, while jail is possible under the law, it is highly unlikely for a routine case and for someone with no record. 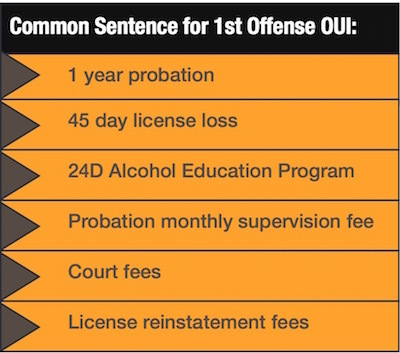 A first offense OUI does carry a maximum penalty of 2.5 years in the house of correction. However, the table to the right represents the common sentence for a First Offense OUI. The table displays the most common sentence whether someone is found guilty after trial or admits to a Continuance Without a Finding or CWOF as part of a plea deal. If you resolve the case prior to trial, in almost all cases you will receive a Continuance Without a Finding for a year with the same conditions of probation as listed in the table. While these are the consequences of an OUI conviction in court a first offense, OUI does impose some additional penalties in terms of your license. This will depend on whether you took or refused a breath test. The RMV will impose these administrative penalties. If you REFUSED to take a breath test you will face a six-month suspension of your license if it is your first offense and you are over 21 years of age. If you took a breath test and FAILED you would face a 30-day license loss. An OUI conviction or admitting admit guilt to the OUI offense. Refusing the breath test or having a breath test over .08. NOTE: In some cases, you will have completed the registry license suspension- whether for failing the breath test or refusing to take it- prior to the actual OUI offense being resolved in court. This means you will face an additional suspension depending on whether you are convicted of an OUI or not. There is no eligibility for a hardship license while the breath test refusal suspension or breath test failure suspension is running UNLESS you resolve the underlying OUI charge and receive a plea deal involving completing the 24D Alcohol Education Program. However, if the case is still pending after six months or after the 30 day suspension, you can obtain your full license back while the case is pending, and should do so when eligible. License consequences and the consequences of the convictions can be confusing. If you have any questions about this page or an OUI charge, feel free to call me directly at 781-686-5924. Is CWOF a good deal on a first offense OUI charge?